This is the third post in a series about how Watermark reaches our local community. After discussing how we engage the community missionally and then specifically how we work through ministry partners, we wanted to share how we first developed our ministry approach – using a principle that still impacts how we do this today! What Are We (Not) Called to? Years ago, we came to the realization that Watermark was not called to do everything. We weren’t supposed to try to tackle all of the needs across the city. But we were called to do something. 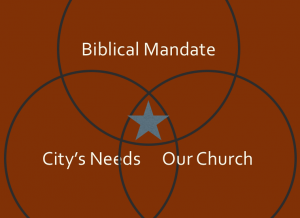 We started by looking first at the biblical principles that guided the church in engaging the community. Passages like Isaiah 58, Micah 6:8, 1 John 3:17, Jeremiah 29, and Matthew 25 were instructive. They reinforced the idea that God cares about all people – but has specifically called His church also to love and care for people who might not otherwise have a voice, have influence, or have a connection to the gospel in word or deed. Secondly, we looked at the needs facing our city – the challenges and the assets. We knew God was already at work across the city. Our job was to find places to join Him in His work. We asked lots of questions across our city and listened to folks from the mayor’s office down to folks on the street. Ultimately, there were over 30 key needs that people identified. That might seem overwhelming. But (as we’ve written about before), it was an overwhelming opportunity. As I mentioned above, there were challenges in our city but also assets – encouraging things about our city, key leaders who would help create change, and individuals in all sorts of spheres whom God had already equipped to take part. As we looked before us, we knew that each vital need meant we had the chance to bring God glory by mobilizing our people to transform the community. An opportunity indeed! How Has God Equipped Us? Lastly, we knew that God uniquely gifts and resources his churches in different ways. So we looked at WHO God had already brought to our body and HOW they were utilizing their gifts, skills, and passions to advance His kingdom. That would help us further understand what He was leading us to do. We continue to watch what God shows us about His heart for people and for our city. For instance, one topic we’ve been studying is “Work as Worship” – how we can serve the Lord in our daily jobs. We still work to identify the needs of the city – like discussing a new residential development being built near Watermark. We still pay attention to how God is equipping our body – such as working through the information about external serving our people recently shared through this year’s 4B survey.